This Anglo/Indian dish uses the gentle spices – ginger and turmeric- which have a soothing effect on the gut. Spring onion tops give the flavour of onions without the symptoms. This is a lovely brunch or light super dish. 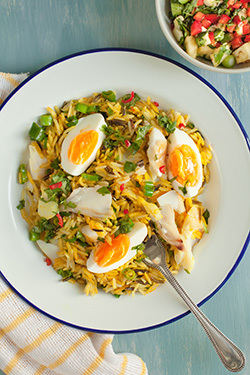 This version of kedgeree does not contain raisins which are high in fermentable carbohydrates. Heat 2 tablespoons of oil in a large frying pan and add the spring onion tops. Add the ginger and turmeric followed by the rice. Stir well and add twice the volume of water to rice and a good pinch of salt. Bring to the boil, reduce to a simmer and cover with a lid. Cook for 20 minutes without disturbing the rice. Then for the last 5 minutes of cooking time place the smoked haddock on top of the rice and replace the lid. Cook gently for 5 minutes. Meanwhile place eggs in cold water and bring to the boil. Reduce heat slightly and boil the eggs for 6 minutes. Allow the eggs to cool, peel and cut into quarters. Scatter the chopped coriander over the kedgeree before serving. 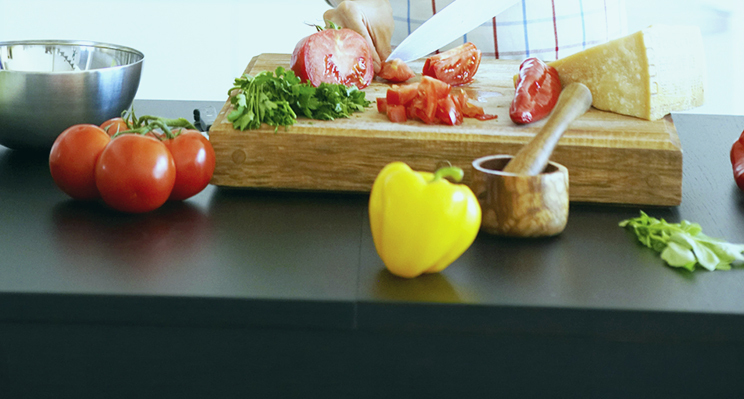 FODMAPs None – the white part of the spring onion is a FODMAP so only use the green leaves of the spring onion if you are trying to avoid FODMAP foods.